This is actually a review of three books, not one, as Aidan’s story is told in a trilogy, though really it’s just one long book. I stumbled upon a signed copy of the first book in the children’s section of a local book store, which I thought was pretty cool. Later, I would find out that the author, Alan St. Jean, was from the city I live in, and is a public speaker as well. He hasn’t written many books, isn’t too widely known, but was just talented enough to produce a few children’s fantasy books that my kids just loved. I felt lucky to come across a local author, some fanciful fiction, and an entertaining tale, even if it won’t go down as one of the best series I have read. Aidan, our hero, is about to go on an adventure to save the world. A typical setup, and one that follows the common path, but in a way that’s a great introduction into the genre for young fans. In The Journey Begins, Aidan discovers that he is the chosen one who must defeat the evil Raven, Lord of Dunjon. A war is threatening the entire land, with Raven at its head, and good must come together to defeat evil once & for all. 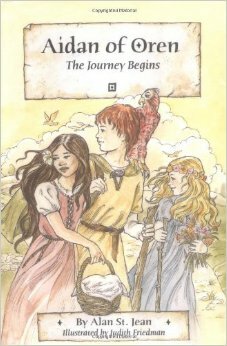 In The Elf Princess, Aidan learns that he must visit the elves, for they will help him to control the powers that he was born with but does not fully understand. And in Valley of the Dragons, Aidan must solve the puzzle of the missing Guardians if he is to stop Raven from completing his evil conquest. It’s the classic background; a boy learns that he’s special, takes his friends with him on a journey, has adventures along the way, begins to understand his own destiny, fights the evil man who wants to control the world. But it’s written with obvious love for the genre, and should be a great entry for kids into the world of fantasy novels. As an adult, it’s not perfect. There are far too many side-stories, too much information that doesn’t all come together in a succinct manner, too few credible explanations for when things go right, and plot holes throughout. I found myself getting frustrated, until I remembered that the books were made for a much younger audience. Although, the best of the best can be enjoyed at any age & always make beautiful sense. So perhaps Aidan of Oren isn’t a great work of fiction, but it’s a nice story that my kids really enjoyed, and the work of an amateur that did just enough right.